Ten thousand years ago, the people living in Eastern Nevada sought well-watered oases like Rainbow Canyon. Distinctive cultures, known today as the Desert Archaic Fremont, and Southern Paiute, visited Rainbow Canyon and used Etna Cave as a temporary home. Their lifestyles were organized around the hunting of bighorn sheep, deer and rabbits. They also gathered pinyon nuts, the seeds of Indian Rice Grass and other local plants. Unlike the earlier Desert Archaic people, the Fremont and Southern Paiute grew crops, perhaps planting small fields of corn. Beans, squash and sunflowers were grown in the flood plain ofMeadow ValleyWash. They also carefully crafted pottery, stone tools, hide moccasins and baskets. A large number of perishable artifacts, including sandal fragments and herb bundles, have helped archeologists to date when these different groups were using the natural resources of the canyon. By AD 1300, the Fremont had disappeared from the archeological record of Southern Nevada, perhaps as a result of long-term droughts or other, as yet, unknown factors. Early 19th century Anglo-European explorers reported finding only small groups of Southern Paiutes, who still followed the age old hunting and gathering practices of the first visitors to Rainbow Canyon. 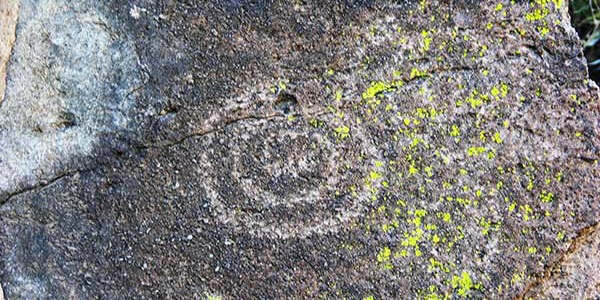 Rock art, appearing as petroglyphs and pictographs, offers clues to the beliefs and artistic concepts of these people. There are four major stops along Rainbow Canyon, Highway 317. 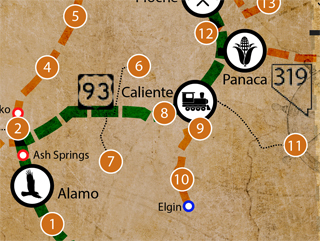 The distances are calculated from the town of Caliente, at the intersection of Highway 317 and Highway 93. These distances along with GPS coordinates are listed with the information for each of the stops.